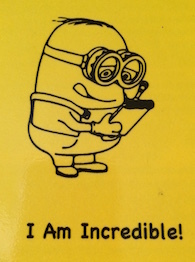 "I am incredible!" is the message of this Bible lesson for kids. Walk through Bible verses from Genesis 1 & 2 along with Psalm 139 and others to point out that we are each uniquely special and incredible because of the Creative God that made us! This Bible study lesson has many parts so that it can be adapted to whatever timetable you may have and according to how many students you are teaching. I taught the whole lesson with all but the extra activities in about an hour with thirty 3rd-6th graders. Items needed: Dry erase board & markers or something similar for Pictionary; a photo of someone and cell phone. Time Element: This lesson took almost an hour with all activities done with a class of about thirty third through sixth graders. Some activities may be removed for a shorter lesson. Rec. Game with Tie-in: Photo scavenger hunt – using cell phones, each group will have a list of things to take photos of and report back within a time limit. 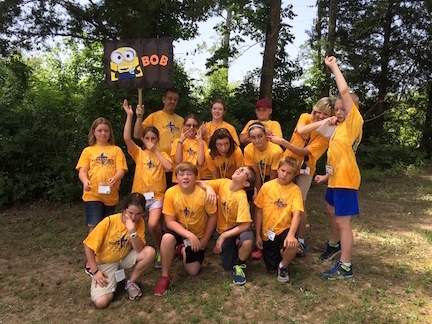 Points to Emphasize for "I am Incredible"
We are each created to be wonderfully unique and can say "I am incredible!" because God created us in His image! God knows me & wants me to know Him. He is all- seeing, all-knowing, all-powerful, and everywhere present…He is the great I AM. Because of sin though we no longer reflect God’s image, but His greatest gift is to allow us to know Him through Jesus! When we are “incredible” for God, we make Him “credible” to others! 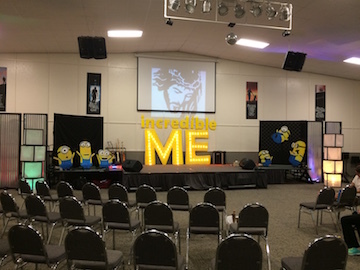 Printable Bible Lesson - "I am Incredible"
Recruit another adult to “argue” the point of which one of you is more “incredible”. Begin skit by saying “I am incredible!” (very enthusiastically! ); have other adult say, “No, I am incredible!” Continue for a few minutes “arguing” the point by saying back and forth – “I am incredible because… (I can jump high; I have strong muscles; etc.) Get silly with it! Finally look at the students and ask them who they think is more incredible…take a vote if you want! 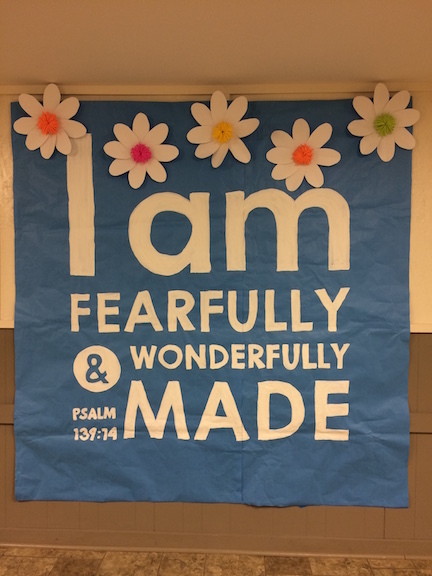 After calming everyone down, let students know that through these "I am Incredible" Bible lessons we will be learning that each one of us is incredible in their own way. We are each unique and special…but not because of what we can do or be, but because of Who created us – GOD! Point 1 (20 min. ): "Who Am I?" I am unique and created by God in His image...I am INCREDIBLE! Activity 1 - DNA - "I am unique!" * Have those with blue eyes stand. Everyone sit. * Finally have everyone clasp their hands together without thinking about it. Have them look to see which thumb is on top and if their left thumb is on top to stand. Genetic studies have shown that about 55% clasp with their left thumb on top and 45% with their right hand on top. Everyone sit. The point is that God has created us to inherit different genes. No two people have the exact same DNA! We are created to be different…unique…which is INCREDIBLE – unbelievable and wonderful! Say it..."I am incredible!" Look again at Psalm 139. Have different students read one verse each of verses 13-16. Not only are we unique from each other, but we are uniquely created, wonderfully made different from any other created thing! God knows us and we have been created to know Him! Let’s go back to THE BEGINNING…turn back in your Bibles to the first book, the first chapter, the first verse…Genesis 1:1. Have someone read this verse out loud. I am Incredible - photo/image: Before class begins use your phone to take a picture of someone that will be in the room during the lesson. Tell the class that you are going to describe someone in the room and begin ‘vaguely’ describing that person; have students raise their hand and guess if they think they know who it is. Hopefully they won’t guess. Then ask them if it would help them if you showed them a photo. Is the photo of the person actually the person? (No!) Does the picture look like the person? (Yes!) It is their image. We are not God, but we were created to look like God in every way…the way we act, the way we talk, the way we love. Show students the photo of yourself you brought. Scribble over it with the marker and crumple it. Just like this picture…it’s hard to tell who it was a picture of now! Explain that God created us in His image, but sin came into the world and has caused us to no longer look like God. When we are unkind to others…we don’t look like God…it is sin. When we tell something that is not true (a lie)…we don’t look like God…it is sin. When we disobey our moms & dads…we don’t look like God…it is sin. When we talk behind our friends backs or bully someone…we don’t look like God..it is sin. Point 2 (20 min. ): Who is God? He is the Creator! He knows me & wants me to know Him! Let’s look at Psalm 139 from the beginning. Have different students read one verse each of Psalm 139:1 – 6. From the very beginning of creation, God has wanted us to know Him. Let’s go back and look at Genesis 2. It tells the creation story also, but there is something unique & different. Have students compare Genesis 1:1 with Genesis 2:4 to see what is different about what God is called. In chapter 1 it just says ‘God’ in chapter 2 over and over He is called LORD God. This is special and unique! Have students look through chapter 2 and count how many times they see LORD in capital letters. Tell them that any time they see LORD in all capital letters in the Bible it is God’s personal name! From the very beginning God wanted us to know Him…to have a relationship with Him! Use the example of someone famous; say “you know them as “…”, but their family knows them as “….“ God doesn’t want us just to know about Him, He wants us to really know Him…as a Father and a friend. When God spoke to Moses out of the burning bush, Moses asked God who he should say had sent him to lead the people out of Egypt. God told Moses to tell the people that “I AM, WHO I AM” had sent him. God is and always has been. He was not created. He has always existed and always will exist. He is is all-seeing, all-knowing, all-powerful, and everywhere present…He is the great I AM…and He wants us to know Him and know Him by His personal name! There is still a problem though…that sin that messed up our image of God in us…it also keeps us away from knowing God. We can’t fix it ourselves (try wiping off the marker with a wet wipe; it should make the picture even worse). We just make things worse. The only way to fix it would be to take a new picture. 2 Corinthians 5:17 tells us that we can be made into new creations! It makes me think of an ugly caterpillar that turns into a beautiful butterfly! Jesus went on to explain and I bet you can say John 3:16 with me! (Quote it all together) Did you know that Jesus had said those words to Nicodemus? What did John 3:16 say God did? What does it say we need to do to be right with God again and have eternal life? Believe…it means to not only believe in our head, but in our hearts we are to trust God with all that we are. God wants us to know Him through Jesus Christ. He is “I AM”. A little further in the Gospel of John, Jesus uses 7 “I am” statements to tell Who He is. Let’s look at these. Ask for volunteers. Give each a word with a Scripture reference. (bread, light, gate, shepherd, resurrection, vine) Have them draw the item for others to guess and then share the Scripture reference for someone to read and see if they guessed correctly. After someone reads each one, allow a few students to share what they think the statement means for us. Have everyone to look up John 14:6 together at the end and read. Remind them that Jesus, God Himself, said that He was the WAY, the TRUTH, & the LIFE…no one comes to the Father except through Him. The world may say there are many ways to God, many ways to heaven, but Jesus said He is the ONLY way. Who will we believe & trust? John 6:35 “I am the bread of life.” (He is all we need. Every time you see the word LORD all in capital letters, let it remind you of Who God is and how much He loves you! He created you unique and special and to be incredible for Him! Let's say it again - "I am incredible!" When we live an incredible life in Jesus, we make God credible (believable) for others! We reflect His image…they can see a picture of God in us! They can see God’s love in us and for us and for them! “I Am Created!” – I am INCREDIBLE because God created me in His image! “I Am Chosen! – I am INCREDIBLE because God loves me and let’s me choose Him! “I Am Christ’s!- I am INCREDIBLE because with Jesus I am never alone; He is always with me & has made me a part of God’s family! “I am Called!” – I am INCREDIBLE because God has a plan & purpose for my life! Lead students in silently praying to God. Use the following ideas or create your own prayer prompts. Let’s start our prayer praising God. Tell God how “Incredible” He is! If there is anything in your life that you know of that God may not be pleased about, let Him know you agree it is wrong and ask Him to forgive you. Now think of some things you want to thank God for and tell Him thank you for each. Also thank God for bringing you to camp this week. Ask God to speak to you this week & help you listen to Him and come to know Him better. Tell Him about any worries or needs you may have. Yes, He knows everything, but He wants you to come and talk to Him about everything and ask for His help. Pray for others that you know of that need God’s help – maybe they are sick or sad or need to know that God loves them. Close the prayer time with a short prayer of your own. Play a game like "I Spy", but have kids take a photo with your phone while no one is looking and begin describing object until someone guesses it. Have a photo scavenger hunt. Students must take a photo of each item listed. Have kids draw an image of a mystery word. Others must guess what it is. Next Bible Lesson on Identity - "I am Chosen!"